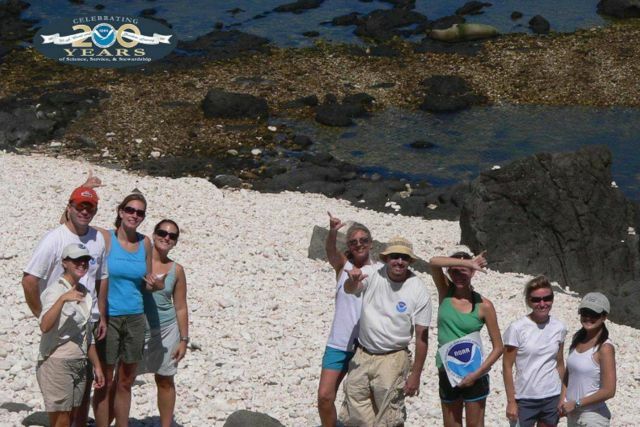 NOAA fisheries, Protected Resources Division of the Pacific Islands Region are shown with Monk Seal N9 (sleeping upper right). They hiked out to this remote area of Oahu to find this seal. L-R: en Metz, Chris Yates, Kim Maison, Krista Graham, Jayne LeFors, David Schofield, Stephani Harrison, Lisa Van Atta, and Michelle Yuen.